GS-2648K L2+ Managed Switch is a next-generation Ethernet Switch offering full suite of L2 features, including advanced L3 features such as Static Route that delivers better cost performance and lower total cost of ownership in Enterprise networks via fiber or copper connections. GS-2648K delivers 44 (10M/100M/1G) RJ45 ports, 4 Combo GbE RJ45/SFP ports and RJ45 Console port. GS-2648K provides high HW performance and environment flexibility for SMBs and Enterprises. GS-2648K is ideal to deliver management simplicity, optimum user experience, and lower cost. The embedded Device Managed System is designed to be extremely easy-to-use/manage/install IP Phone, IP Cam, or Wifi-AP for Enterprise Applications. 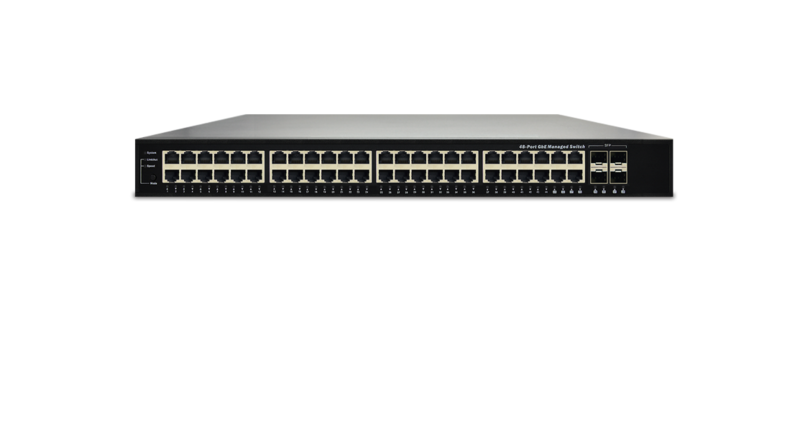 GS-2648K L2+ Managed Switch is a next-generation Ethernet Switch offering full suite of L2 features, including advanced L3 features such as Static Route that delivers the better cost performance and lower total cost of ownership in Enterprise networks via fiber or copper connections. GS-2648K is designed to help companies to save power needs and reduce TCO by Energy Efficient Ethernet (IEEE 802.3az). It can be used for customers to build a green Ethernet networking environment. Rapid Spanning Tree (RSTP) 802.1w:Rapid Spanning Tree Protocol, which provides for faster spanning tree convergence after a topology change. You’ll be noticed a change in whatever your switch happen.